This bright and cheerful studio is filled with natural light. It faces East and has open CITY views. The main room is approximately 16'x13'. The open kitchen has white cabinets and full size appliances. The bathroom is in good condition with the original subway tiles, pedestal sink and a soaking tub. Original prewar details, picture moldings, beamed ceilings and hardwood floors are just some of the features of this studio apartment. 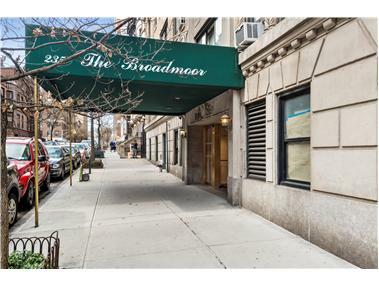 The Broadmoor is a full service building with a 24 HR concierge, doorman, live in super and maintenance personnel. It offers a private glass-encased solarium and a huge rooftop deck with stunning views and free wi-fi access allowing you a serene escape.